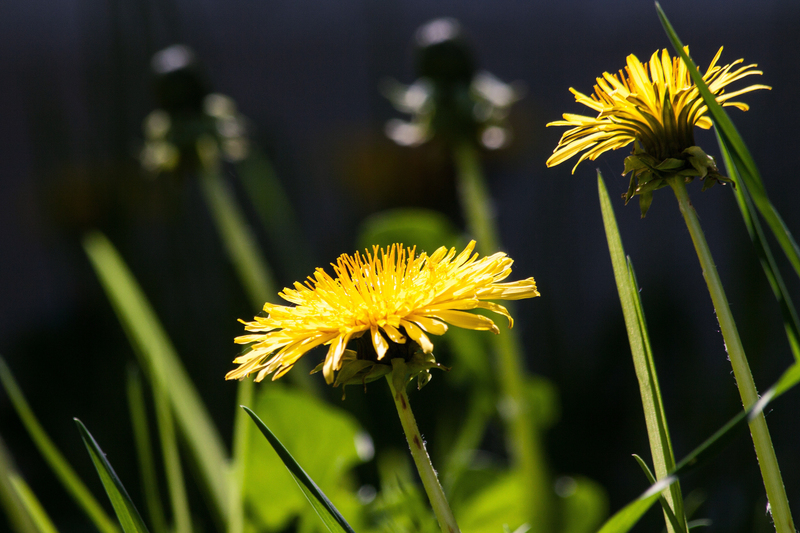 Perhaps we might be inclined to think of dandelions as weeds first and (maybe) as herbs second. But since, by definition, all herbs are weeds. But dandelions are more than just weeds (or herbs). More often than not, they’re the first flower of spring, and so hold a special place, both for the eye and for our body’s “spring cleaning” process. Spring cleaning is an unwavering urge that comes over us as soon as the days start to lengthen—it’s definitely time to dust away the darkness of winter. The same applies to our bodies. During the cold months we conserve energy and naturally slow down; evolutionarily speaking, we just don’t get inspired to really move during the winter. Our metabolism slows down to conserve energy, food and warmth, so the detoxing organs (the liver and kidneys) get a little sluggish, too. We can think of the urge to clean house as a manifestation of what’s going on inside our bodies—our winter-logged systems want that same kind of airing out. Enter dandelion, which helps support the body as it rids itself of stored metabolic wastes. Dandelion is practically an herbal apothecary unto itself: as a powerhouse liver and kidney tonic, it acts as a diuretic, so wastes are removed quickly from the body. As a bitter herb, it stimulates the digestive system, causing you to absorb nutrients from your food more efficiently so that less metabolic waste is generated. This means that the liver can focus on the really important tasks, like helping to rid the body of excess fat stores. And, like all early spring greens, dandelion leaves are loaded with vitamins and trace minerals — something we generally lack over the winter. With this tonic action on the body, dandelion also helps reduce inflammation in the liver. Further, dandelion is very high in vitamins A and C, beta-carotene, potassium, iron and copper, serving as a major nutritional jump-start for the body after a winter of heavy meals. Dandelion serves as a tonic for the whole body, helping correct elimination problems such as constipation, gallstones, indigestion, sluggishness and fatigue. It also helps fight skin problems and may ease the impact of diabetes by helping to regulate blood sugar and lower cholesterol. As soon as you see the tell-tale leaves popping up in your (pesticide-free yard), you can begin by simply adding the young greens to your salads, or lightly steaming or sautéing them. If those options aren’t that appealing to you, try a tea. But, a few notes: As a strong diuretic (which means it helps clear waste and excess fluid from your system — great for relieving bloating, by the way), dandelion shouldn’t be ingested at the same time as other medicines; otherwise, those drugs will flow right out of your system. Time your tea-drinking for 30 minutes before to 1 hour after ingesting any drugs or medications. And, as always, talk to your healthcare provider before taking any herbs. When harvesting dandelions, be sure that they are at least 100 yards away from a road and contain no chemical fertilizers or pesticides. Also be sure that you have permission to harvest if you aren’t on your own land (a universal truth that I’ve discovered — no one will begrudge your taking their dandelions; in fact, people will call and beg you to come to their house and harvest). Gather only young leaves—the older they are, the bitterer. 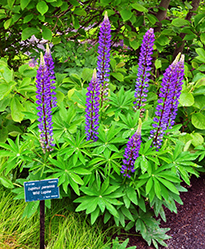 If the flower bud has already formed, cut the plant to the ground and wait for new foliage to appear, then harvest and cut to the ground again. You can do this a few times before the leaves get too bitter. Let some flowers bloom, however; they are good for bees as well as various syrups and dandelion wine. You can gather dandelion leaves and flowers anytime during the growing season, but gather roots, which are especially healing for the liver, after the first frost, when the nutrients have collected in the long taproot. After harvest, carefully wash the roots, chop them, then roast in a 250°F oven, occasionally turning the pieces until they are dry and aromatic. This can take a few hours; keep checking the roots, taking care not to burn them. You can store these for several months in a clean, airtight, container at room temperature. One safety caveat: consult a physician and use dandelion with caution if you suffer from gallstones. Rinse one handful of young dandelion leaves under cold water. Chop the leaves roughly and place in a preheated mug. Pour boiling water over the leaves, cover, and steep for 10 minutes. Drink as much of this as you crave — it’s a wonderful nutritive to restore the body after a long illness or a long winter. Dandelion flower syrup is a great way to get the benefits of this early spring tonic into the little ones of your household. Use to sweeten hot drinks, on its own or as a syrup for French toast or pancakes. Using honey instead of sugar makes this a marvelous cough and cold remedy. 1. Steep the dandelion flowers in 3 cups hot water overnight. 2. Strain the dandelion water into a saucepan and add another cup of water. Add the sugar (or honey) and the fruit. Bring to a boil over medium heat and simmer 15 to 30 minutes, or until the liquid thickens. Strain and store in the fridge. Amy (Jirsa) Holt is the author behind Herbal Goddess: Discover the Amazing Spirit of 12 Healing Herbs, which can be found in our Gardenshop. Coastal Maine Botanical Gardens is once again teaming up with the University of Maine’s Cooperative Extension and Sea Grant to participate in Signs of the Seasons, a citizen-science program that engages volunteers in observing plant and animal phenology (the study of seasonal cycles and the timing of life events, such as when birds make their nests in the spring, when berries ripen in the summer, when leaves change color in the autumn, etc.). All kinds of creatures (humans included) depend on the predictability of these seasonal cycles. But as we’re all aware, seasonal cycles seem to be shifting. That’s where we come in—using our backyards as laboratories, participants in the Signs of the Seasons program, by becoming trained to observe and record plants and animals living in our own communities, help scientists document the local effects of global climate change. Through their observations, volunteers create a detailed record of the region’s seasonal turns, a record that’s then made available to collaborating scientists. As you probably know, farmers, gardeners, fishermen and naturalists have long recorded seasonal observations in their notebooks, logs and ledgers. When combined, those historical records plus modern observations tell scientists that shifts in long-term phenology trends closely match records of the earth’s warming temperature. 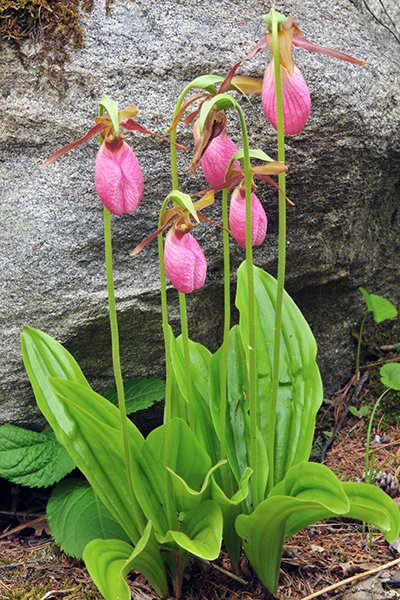 Phenology changes are easy for volunteers of any age to observe and record—after all, we already spend so much time outdoors, noting the first robin of spring, the emergence of the first lady slipper orchid or the first and last trees to lose their leaves in autumn. Those who choose to participate in Signs of the Seasons can follow as many indicator species as they wish, identifying and marking one site—or several—where they’ll observe these species throughout the year. Observations might include sightings of migrating birds, nesting activity, plumage appearance or the flowering and leafing of plants or changing foliage in autumn. As more observations are recorded, the difference between short-term variability and long-term trends becomes clearer. This is invaluable information—it’s simply not possible for scientists alone to gather the vast amount of data needed to monitor these trends as they’re happening. We are the ones who know our local plant and animal communities best. In fact, volunteer phenology monitors are very likely to be the first to notice important changes as they happen. Sound like a project you’re interested in? Join us Monday, April 29 from 12:30 – 3:30 at CMBG’s Bosarge Family Education Center. For more information about the program and to register, visit UMaine’s Cooperative Extension. Questions about this volunteer opportunity may be directed to Elisabeth Maxwell at elisabeth.maxwell@maine.edu. 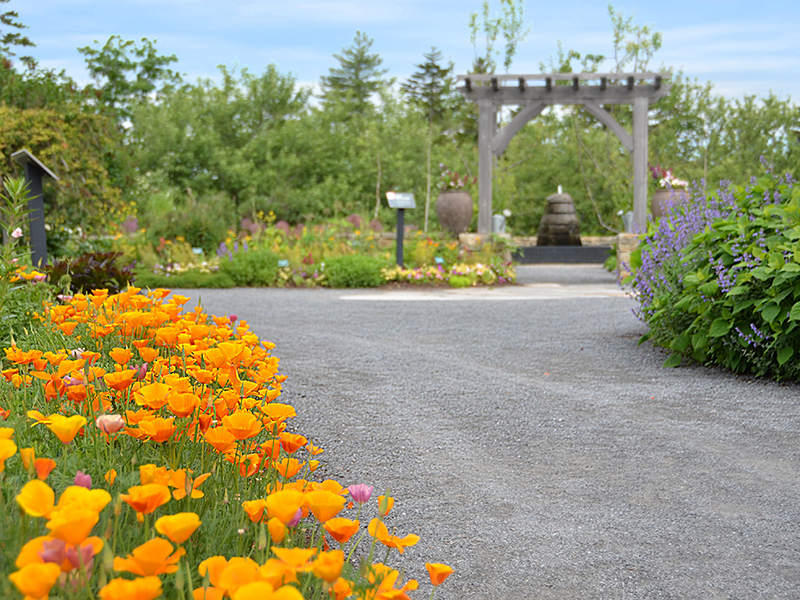 As a horticulturist at Coastal Maine Botanical Gardens, one of my most favorite “duties” is designing new annual plantings and tweaking existing combinations every year. The daughter of two very artistic parents, I grew up making art and creating, and went on to be a fine arts major in college. 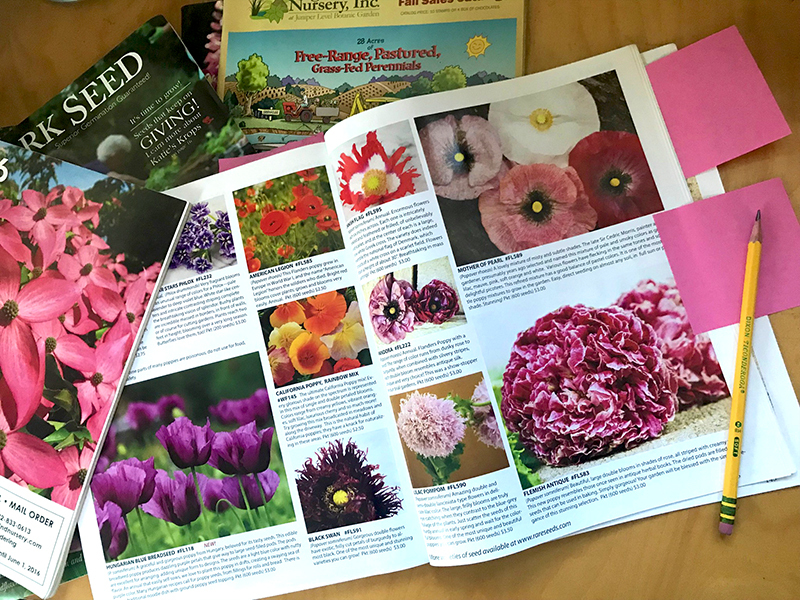 When it came time to graduate, my work in horticulture – both as a summer job in Maine and a work-study position in college – had taught me the pure joy of using plants as a living art medium. The artistic nature of the work was one of the major factors that compelled me to move into horticulture as a career. As you may or may not know, building fairy houses is a Maine tradition. We here at the Gardens celebrate those whimsical roots both in our Fairy Village and with the creative fairy houses built by staff every year for Gardens Aglow. 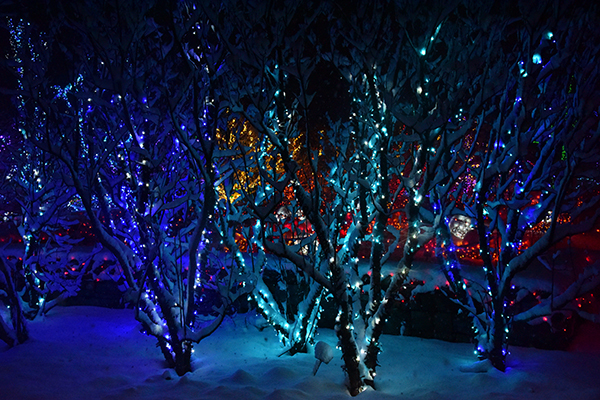 At Gardens Aglow, we use LED lights in our designs be-decking our gardens and encourage others to use them, too. Not only do they last longer, they’re more reliable, more robust, far brighter, and far more energy efficient than their traditional counterparts. But with the upfront cost so much higher than the old incandescents, are they worth the investment? LED lights use light-emitting diodes (hence, LED), rather than filament to produce light. This technology is what gives LED lights all the efficiency props. They don’t burn out, nor do they get hot to the touch, which means they’re safe to use around your holiday trees, wreaths and garlands—indoors or out. How much money and energy do LEDs save? Incandescent bulbs release about 90% of their energy as heat. LEDs, on the other hand, remain cool to the touch and, according to the U.S. Department of Energy, use up to 75% less energy and last 25 times longer. Since LED bulbs don’t burn out (they just get dimmer over time), you don’t have to replace bulbs and fuses. Just plug them in and, given that they’re properly used and stored, they should light up year after year. 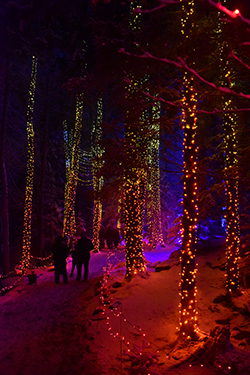 This low-energy usage means your holiday electric bill won’t climb sky high, even if (like us) you tend to go a bit crazy with your illuminated décor… (For example, the total KW for our 650,000 lights is 10 kWh. 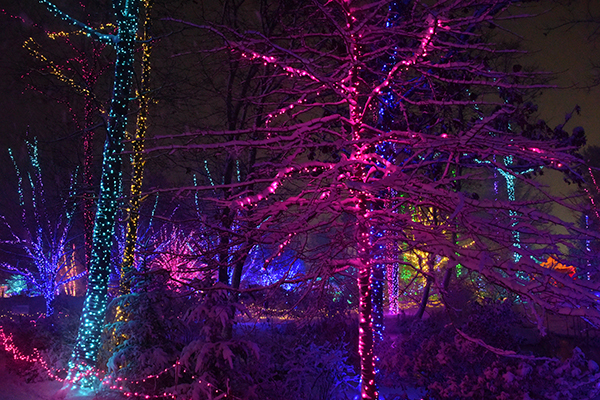 With a cost of 8 cents per kWh, the energy bill for an evening of Gardens Aglow is only $4.00, or $120 for the entirety of our 30-night run). When we decide to switch to the more durable, low fire-hazard, safer LEDs, we have to figure out what to do with our old household bulbs and holiday lights. Rule number one: do not just carelessly throw them away. Twinkle lights, CFLs, fluorescent bulbs, and incandescents should be recycled. CFLs contain mercury, and if they are not properly discarded, they can release that mercury into the environment. Holiday light strands often contain lead, too, in the polyvinyl chloride (PVC) wire coverings—another chemical we don’t want leached into the environment. Luckily for us, established light recycling programs know what to do with old, used, even broken lights. Not sure where to go? Both Home Depot and Lowe’s have collected Christmas lights for recycling. Check with your local store to see if it currently participates in these programs. Most True Value stores, too, will recycle CFL bulbs (but they charge $1/bulb…). Also, many home improvement stores offer trade-in programs, allowing you to turn in your old lights and receive a few dollars off of the newer, energy-efficient sets. Another great option is to check out Christmas Light Source (https://www.christmas-light-source.com/Christmas-Lights-Recycling-Program_c_210.html). They recycle lights all year round and donate recycling proceeds to buy educational books and toys which are donated to Toys for Tots. 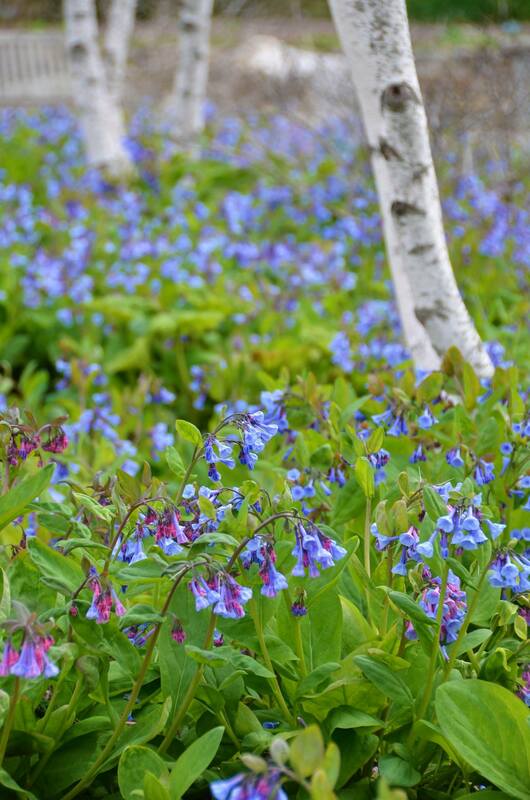 Since getting outdoor lights evenly spaced—with all bulbs facing (more or less) in the same direction—during a Maine autumn is challenging to say the least, we thought we’d share some of our key designer, Anna Leavitt’s favorite tips. 2. Protect your trees— Avoid compacting the soil around trees with ladders and heavy boots, and avoid wrapping trunks and branches too tightly. If you damage your tree, especially in the winter, it’s much more susceptible to disease. Avoid nails, staples, screws or hooks. If your lights need securing, try electrical tape or clips like parapet clips instead, which are especially designed to mount holiday lights. 6. Think inside the box—besides trees, there are oodles of lighting options for the gardener. Have a window box? You can coil light strands on top of the soil, then plant small, hardy shrubs or insert branches (paint them white, gold, or silver for extra holiday oomph). In addition to window boxes, you can try the same trick with planters on your property. Cone trees—either store-bought or homemade—are also a good alternative to wrapping living trees and shrubs. Or if you have a birdbath in your yard, you can pile battery-lit globes or spheres in and around it for a variety of visuals. Alternatively, try twisting rope lighting into various shapes and hanging them from trees or your porch, creating snowflake-like shapes. Disguise the cord with ribbon, if you’d like. 7. When choosing trees to illuminate, deciduous trees are the easiest choice, since they’re easily accessible and the trunks and branches offer a striking silhouette. Opt for interesting trees, but also be sure to choose trees that are strong enough to withstand the weight of the lights in addition to the harsh weather conditions of winter. It might be needless to say, but don’t choose trees that come in contact with power lines. 8. Remember your budget—think about the circumference of a tree and how many times you’d need to wrap it. Plan and budget for every tree, shrub, or stone wall you want to wrap or drape. 9. 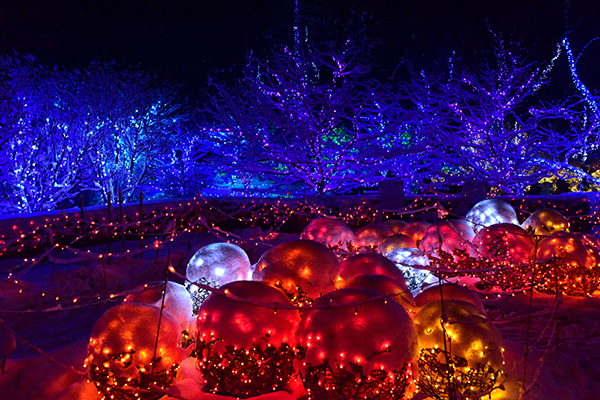 Other materials—you need more than lights to create a magical (and safe) holiday display. You’ll want a sturdy ladder (and someone to spot you), gloves, lights, and clips (remember a staple gun and/or nails can damage a trunk). If you’re wrapping a tree with rugged bark, you probably won’t need anything to fasten the lights to the tree. 10. When wrapping, start from the base, and make sure it’s the visible base. That is, if your tree’s base is hidden by shrubs or stonework, begin at the visible line. Then, start wrapping and space your lines evenly. One easy way to ensure even spacing is to use four fingers between strands as you wrap. When wrapping branches, leave twice that much space so when you double-back, the spacing will stay consistent. 11. It probably could go without saying, but we’ll say it anyway—test your lights and the connections between your strands of lights. 12. Keep track: “I keep track of everything in an Excel spreadsheet, and it’s been updated over the years, so we know how many strands go on each tree or structure and we can keep track of what colors have been done in the past. I also note whether it can be done from the ground, a short ladder or a tall one, or the lift so that I know who—and how many—I need for each task,” Leavitt says. Since it sets the tone for the overall feel of your design, your color palette may be the most important decision you make when you begin your holiday lighting adventures. Color combinations involving red, white, and green typically feel more classic, while unexpected colors like teal or pink feel more whimsical. When selecting your color scheme, think about the scope of your area and try for cohesion, rather than an overwhelming display of color. When it comes to wrapping your trees, your house, or setting up path lighting, you can choose from a variety of approaches. •	For an ombre effect, try stringing lights from dark to light, vertically. •	Choose your favorite color, and make that the dominant hue. Then, choose a complimentary color for your highlights. •	Try the 60-30-10 rule: 60% dominant color, 30% secondary, 10% accent if you’re covering a large amount of space. •	Or try the rule of three: limit your palette to just three colors for an organized, well-balanced design. Winter décor and evergreens seem to go hand in hand. Ever thought to wonder why? Besides the fact that evergreens are often the only sign of life in an otherwise cold, dormant world, they have long been a symbol of life and health. Filling our homes with fragrant pine boughs follows in the footsteps of ancient cultures—all over the world for thousands of years, green plants have been used in solstice celebrations. Traditionally, the oil and resin of fir trees have been used for their antiseptic properties, and bringing boughs into the home can help freshen and disinfect the air, protecting against respiratory illness—an added bonus in the months when we find ourselves gathered in warm, close spaces. Winding evergreens into circlets or wreaths not only brings this breath of fresh air inside where it will be most appreciated, but the shape represents the circle of life—a potent symbol at the solstice celebrating the returning of the light. Tempted to craft your own winter décor? We mined CMBG horticulturist Diane Walden’s 30+ years’ experience for some tips for decorating with evergreens. Walden advises gathering what you can from your own backyard as well as from wild, public spaces. 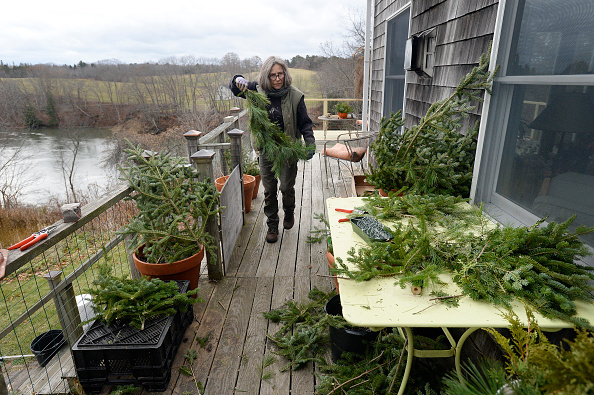 Living as we do in the Pine Tree State, this is a relatively easy task and ensures that the wreaths we make are sustainable and very local. If this is a project you’d like to take on, start now, says Walden—the earlier the better. Look around your property before the snow comes and pick up any windfalls. Pine cones, branches, rosehips, dried flower heads, seed pods, lichen, moss and berries all make wonderful additions to your wreath. If you gather them now and hang them to dry, they’ll be ready for holiday crafting. “You can definitely start scoping out potential cuts. For example, hydrangea is perfect to cut early—but it’s best to cut evergreens only after we’ve had three nights of below-freezing temperatures,” advises Walden. For easy assembly, build your wreath on a wire frame. A well-cared for frame can last you many years. You’ll also need floral wire for attaching your greens to the frame. Gather roughly eight pounds of greenery, cut 6-8” in length. Attach a hand to the frame by wrapping the lower 1/2-1/3 of the individual bundle three times with your wire and pull tight. After you tie one hand to the frame, tie the next one 2-3” from the last. Keep going, overlapping your hands, until your frame is full. Walden suggests alternating hands of different greens or using hands made up of mixed greens—experiment to see what feels right. To make your wreath last all season, hang it in a cooler section of your house and mist it occasionally with water to avoid drying and dropped needles. Want to tackle a two-sider? Then every time you tie a hand to your frame, flip your ring over and tie another to the back. If you’ve gathered an enormous amount of greenery (or you just want to keep crafting), try filling a decorative basket with evergreen boughs and some of your add-ins. Prop the basket on a table or hang it on your door or above the mantel. For a smaller-scale creation, try bouquets of greenery—glass or ceramic wall vases make perfect vehicles for your leftover boughs. Still have some extras? Think outside the box(wood)—in lieu of a bow, greenery also makes great gift toppers. And after the holidays? “Whip on some suet blocks and hang your wreath outside for the birds. 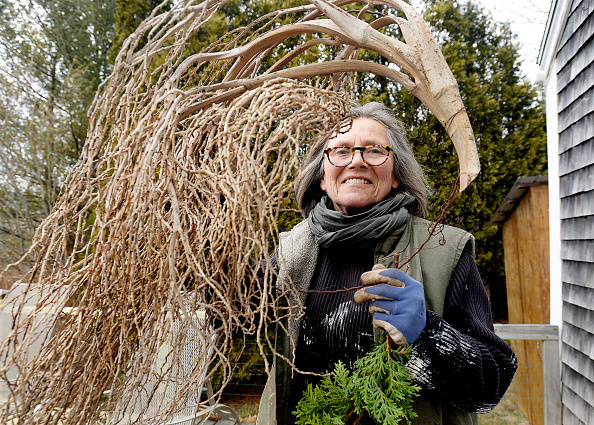 When the greens become unsightly, unwind the floral wire to disassemble your wreath,” Walden advises. Greens can be composted or tossed into the woods to decompose naturally.